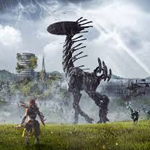 I promised I would have a live stream of Horizon Zero Dawn on launch day and so here it is. It is a beautiful game with what seems like a very deep story. The mechanics are a little hard to get used to, but I have the feeling that they will be great with a little practice. It also has crafting which I can’t wait to get into in upcoming videos! Thank you to everyone that joined me! It was a ton of fun! You guys will decide whether I play The Witness or Horizon Zero Dawn on Thursday based on your likes.